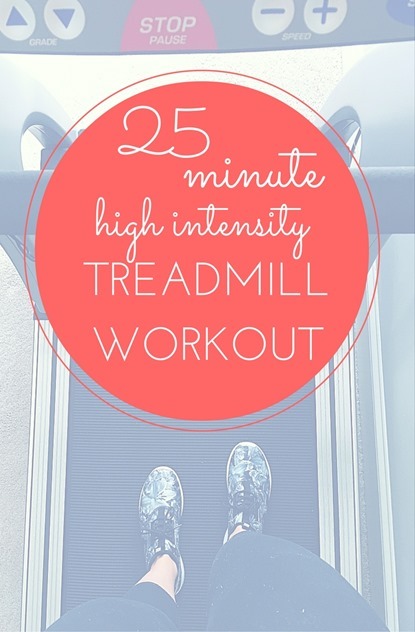 It’s been a LONG time since I’ve shared a treadmill workout on this blog. Months and months! I apologize, especially since every time I put out a call for PBF workout requests, treadmill workouts always pop up as one of the most common workouts you guys want to see more of on the blog. The good news is that the delay in sharing this workout means it is a workout I’ve done many, many times (pre-broken toe!) and tweaked to morph into one of my favorite go-to naptime workouts. My mother-in-law kindly gave us her treadmill a while back, and it’s a great piece of workout equipment to have on hand on days when I cannot make it to the gym but want to work up a quick sweat while Chase is sleeping. And when I say a quick sweat, I mean it. This workout is only 25 minutes long but it’s a challenging one thanks to intense intervals that will get your heart pumping. (<—I accidentally typed “get your heart pumpkin” right there at first… Clearly Halloween is still on my mind.) I finally took my tattered piece of paper with this workout on it and transformed it into a graphic you can easily print out, save on your phone (click on the image to save it or just take a screen shot) or pin to Pinterest for later. I hope it motivates you to kick things up a notch the next time you hop on the treadmill! You can easily increase or decrease the intensity of this workout to match your current fitness level. Just play around with the speed and increase or decrease the speeds by 1.0 or 2.0 in the intervals to make this workout perfect for you. Challenge yourself but honor your body! You may also see a bunch of my favorite treadmill workouts on my Treadmill Workouts Pinterest page! Thanks for sharing–looks like a good one!! Hope that you guys had a lovely Halloween! Thank you, Heather. <3 I hope you did, too! This is the only way I can get through a run – adding in challenges such as speed, intervals or hills. Looks like a great one to add into my routines! I love interval workouts like this on the treadmill, they make the time fly by. Love it! I’m always looking for good treadmill workouts and this one looks like a lot of fun. I’ve been getting some great treadmill interval ideas from Orangetheory classes, too! Yes! OrangeTheory is the KING of treadmill intervals! Love this one it reminds me of OrangeTheory! Thinking of your and your family after you shared yesterday’s post. I will definitely have to give that pumpkin muffin recipe a try for my soon to be little one. Awesome workout, I may tone it down a bit since I’m pregnant but such a good way to get some quick exercise! HIIT workouts are perfect for getting in a great workout in a short amount of time. I’ll definitely be trying this workout at the gym this week. Thanks for sharing. I can’t believe I wasn’t following you on Pinterest. Now I am. 🙂 I really love your treadmill workouts. This is perfect. Thank you! I hope your heart is continuing to heal this week. When you do intervals like this, 25 minutes is all you need. So cool you have a tread in your house for nap times. Have a great day, Julie! Intervals are about the other thing that keep me sane when it’s a treadmill day and my mind is bouncing from the day. Tried this HIIT Workout yesterday-it was an awesome, quick way to get my cardio in. I will definitely be trying some of your other treadmill workouts. Thanks! So glad to hear it! Thanks for reporting back, Sarah! Thanks for the workout. I have printed this off. 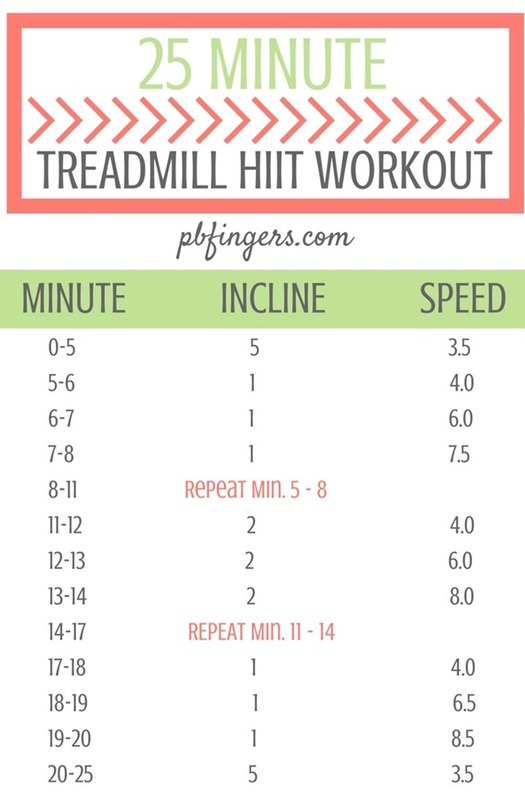 I love trying different treadmill workouts and will be trying this one out this weekend. Have a great weekend. This couldn’t have come at a better time! I printed this and took it to a library conference I went to and it was the perfect workout for the hotel fitness room. I also love using treadmill workouts when I’m away from home since my ancient treadmill at home doesn’t tell me what the incline is (just goes up and down) and I’m never exactly sure how accurate speed is. This was a great one!